The 42nd (Royal Highland) Regiment of Foot was an infantry regiment of the British Army. Originally the 43rd Highlanders, they were renumbered the 42nd in 1748. 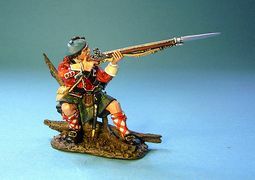 After the 1715 Jacobite Rising the British government did not have the resources or manpower to keep a standing army in the Scottish highlands. As a result, they were forced to keep order by recruiting men from local Highland clans that had been loyal to the Whigs. This proved to be unsuccessful in deterring crime, especially cattle rustling, so independent companies (of what would be known as the Black Watch) were raised as a militia in 1725 by George Wade to keep "watch" for crime, and "Black" which came from the dark tartan that they wore. in 1881, when the 42nd amalgamated with the 73rd Regiment of Foot, the new regiment was named 'The Black Watch (Royal Highlanders)'.